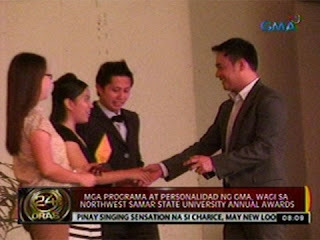 Winners of the Northwest Samar State University Annual Awards (2012) or NSSU Student's Choice Awards has been revealed on Friday, March 9, 2012. Kapuso Station GMA-7 was awarded as BEST TV NETWORK with Balanced Programming with over-all twenty-two (22) recognitions out of 32 for its shows and personalities in different categories in the recently concluded Northwest Samar State University Annual Awards (Student's Choice Awards). Voted by more than 7, 000 students of the campus, Amaya and Marian Rivera are Best Teleserye and Best Actress recipients. Kapuso Mo, Jessica Soho (One at Heart, Jessica Soho)- Best Magazine Prog. Other awardees will be added here as information becomes available online. The Northwest Samar State University (NSSU) is a public university in the Philippines located in Calbayog City with extension campus in San Jorge, Samar. It is mandated to provide advanced education, higher technological, professional instruction and training in trade, fishery, agriculture, science, education, commerce, engineering, forestry, nautical courses and other related fields. It is also mandated to undertake research and extension services, and provide progressive leadership in its areas of specialization. Its main campus is in Calbayog City.